Jesus came to try to make Salvation as EASY as He possibly could!--And that's why the Religionists crucified Him, that's why they killed Him, because the Church System of the day as good as said it couldn't be done without THEM, without following all of their complicated laws, traditions & religious rigmarole! But Jesus came and showed them that they didn't have to go to church on Sunday--or Saturday or Friday or any other day of the week! They didn't have to follow the Church laws and rules and regulations and the Ten Commandments and all the rest. All they had to do was simply confess that they were sinners and needed Salvation and ask Jesus to give it to them! The whole idea is so simple and so childlike that Jesus said that you must become as a LITTLE CHILD to enter God's spiritual Kingdom of love, joy and happiness here and now in this life--as well as a beautiful, wonderful and thrilling Eternity in His Heavenly Kingdom in the next life! He said, "Except ye be converted and become as little children, ye shall not enter into the Kingdom of Heaven! ", and "Except a man be BORN AGAIN, he cannot see or understand the Kingdom of God!" --Matthew 18:3; John 3:3. Of course, nobody can really FULLY understand Salvation.--That's why Jesus said that you must be like a little child and just accept it by faith! The Bible says that the love and peace of God "PASSES all understanding".--Ephesians 3:19; Philippians 4:7. It's a love which passes your understanding and lands right down in your heart!--You don't have to understand all about God to know His wonderful love and Salvation in Jesus. All you have to do is RECEIVE it! Don't try to FIGURE Him OUT--just LET Him IN! It's just that simple! Jesus said, "I am the DOOR"--into His Father's House, the Kingdom of God--"by ME, if any man enter in, he shall be SAVED." --John 10:9. So if you want to get to Heaven, you need to walk through JESUS, the open Door. All you have to do is believe in the Door, walk through it by faith, receive Jesus into your heart, and you're saved!--You've entered the Heavenly sphere of Salvation, Heaven on Earth, the Kingdom of God! The Bible tells us that "God is LOVE"!--1John 4:8. And what did God do to prove that He is Love, that He loves us?--"God so loved the WORLD"--you and I--"that He gave His only begotten Son, that whosoever believeth in Him should not perish, but have everlasting life." --John 3:16. God loved you so much that He gave His Own Son, Jesus, to suffer for your sins. Jesus is the manifestation of God's Love for us. "Oh, why can't you just leave JESUS out of it?" some people ask. "Why do you have to use that name? Why does He always have to be the symbol? Why can't you just say GOD, and speak of God only? Then we could accept it much easier, if you wouldn't insist on using that Name of JESUS!" "Well," I usually reply, "why NOT?" If He really IS God's Son and God has chosen Jesus to reveal Himself to the World and to show His Love, then God Himself has insisted on it!--"Love Me, love My Son!" These are GOD'S conditions, not ours. "Whosoever denieth the SON, the same hath NOT the FATHER: But he that hath the Son hath the Father also." --1John 2:23. Jesus Himself said, "I am the WAY, the TRUTH, and the LIFE: no man cometh unto the Father, but by ME!" --John 14:6. So all you need for Salvation is Jesus! We can't even comprehend God the Father, He's too great a concept for us to even DREAM of! "As high as the Heavens are above the Earth, so high are His ways above our ways and His thoughts above our thoughts; and even the Heaven of Heavens cannot contain Him"!--Isaiah 55:9; 1Kings 8:27. None of us can really grasp how great and how marvellous and how wonderful God our Father is, far beyond the mind of man and our wildest imaginations, for He and His Spirit surpass the whole Universe! But He has stooped to send us His Son, Jesus, to SHOW us what HE Himself is like. This then, is the MOST important will of God for you: that you recognise Jesus as the Son of God and believe on Him as your Saviour and receive His Love and forgiveness and gift of Eternal Life from God! WHY do you need to be forgiven?--Because we are all sinners. The Bible says, "ALL have sinned and come short of the glory of God. For the WAGES of sin is DEATH, but the GIFT of God is ETERNAL LIFE through Jesus Christ, our Lord." --Romans 3:23;6:23. So we must first confess that we know we're sinners. But some folks say, "Well, I'M pretty good! God will surely give me credit for being pretty good, at least a lot better than many others!" --No, I'm sorry, that's not good enough! Because you can't go to Heaven unless you're PERFECT, and NOBODY'S perfect! The King James Version of the Bible says that "all our OWN righteousness is as filthy rags".--Isaiah 64:6. In the original Hebrew, this passage literally says that our own self-righteousness, our own goodness, is like "filthy menstruous rags".--That's how God looks on the so-called "good" people, those who pride themselves in being better than others: "I'm good! I don't do this, I don't do that, I don't do so-and-so!" What we all need to do is just honestly admit, "I'm just no good! I'm bad, of course I make mistakes!" THAT'S why Jesus died, because we're all sinners and it's impossible for any of us to be good enough, it's impossible for us to keep God's perfect laws like the Ten Commandments.--It's just IMPOSSIBLE! Only JESUS is perfect and that's why only He could pay the price for our sins and God could forgive us, because HE took OUR punishment FOR us. That's why He could give us Salvation as a GIFT, because we could never earn it or deserve it ourselves. It's just like a PARDON: God has offered pardon to the guilty, and it doesn't matter HOW bad you are or WHAT you've done--it doesn't matter to God! If you'll just humbly confess that you're a sinner and ask Him to forgive you and take Jesus into your heart, He'll save you! You couldn't lift yourself up by your own bootstraps, you couldn't save yourself, you couldn't be good enough, it's IMPOSSIBLE! We CANNOT save OURSELVES by our own WORKS, our own goodness, our own attempts to keep His laws and to love Him, or even our own endeavours to find and follow His Truth! Salvation is a GIFT of God! "For by GRACE are ye saved through FAITH; and that NOT of YOURSELVES: it is the GIFT of God!--NOT of WORKS, lest any man should boast!" --Ephesians 2:8,9. You cannot save yourself no matter HOW good you try to be! You can't be good enough, you can't be perfect enough to earn, merit or deserve the Heavenly perfection of His Own Holy Salvation by His Own grace, love and mercy! There's nothing you can do to get it except just RECEIVE it by FAITH!--That's all! You can't be good enough, you can't work hard enough, you can't get it on your own no matter HOW hard you try! You just have to humble yourself and admit that you don't deserve it, that you're just a lost sinner, and that there's no other way for you to make it to Heaven except by the grace of God! Salvation is purely a GIFT, and all we have to do is just believe and receive it, nothing else! But many people are too PROUD to accept a gift, they want to WORK for everything they receive. In fact, that is the belief of most religions, that if you're good enough and you follow all their rules and rituals and regulations, etc., then YOU can save YOURSELF. But that's a lie! No amount of religious rigmarole or church-going or masses or services or prayers or anything else is going to save you!--Only JESUS saves! "NOT by works of righteousness which WE have done, but according to His MERCY He saved us." --Titus 3:5. Only JESUS can free us from sin and its power and its condemnation!--"For if we CONFESS our sins, He is faithful and just to FORGIVE us our sins, and to CLEANSE us from all unrighteousness! For the blood of Jesus Christ, God's Son, cleanseth us from ALL sin!" --1John 1:9,7. God will forgive you for EVERY sin in the book, except ONE, and that's rejecting JESUS!--His Word calls that "blasphemy against the Holy Ghost", the Spirit of Truth.--Mark 3:28,29. The only unpardonable sin is the sin of rejecting the Holy Ghost, of refusing to heed the Voice of God and of spurning His Love and His Salvation in Jesus. This, He says, won't be forgiven in this life, nor even in the World to come.--Matthew 12:32. So the great condemnation is not that men are ALREADY sinful, which God CAN forgive and DOES forgive if we receive His pardon through His Son. But the great condemnation is rejecting Jesus Christ!--"THIS is the condemnation, that Light is come into the World, and men loved darkness rather than Light, because their deeds were evil." --John 3:19. But if you COME to the Light, Jesus, "the Light of the World" (John 8:12), "there is no CONDEMNATION to them which are in Christ Jesus" (Romans 8:1), to them that have received Christ and His forgiveness! The Lord says, "Let the wicked forsake his way, and the unrighteous man his thoughts: and let him return unto the Lord, and He will abundantly pardon. Though your sins be as scarlet, they shall be as white as snow! Though they be red like crimson, they shall be as wool!" --Isaiah 55:7;1:18. You can start all over with the Lord! When you let Jesus into your life, He will "blot out your sins as a cloud, and as a thick cloud, He'll put them behind His back, and will remember them against you no more." --Isaiah 44:22;38:17; Hebrews 8:12. And once you have received Jesus, you cannot lose Him, He will never cast you out! "All that the Father giveth Me shall come to Me; and him that cometh to Me I will in NO WISE cast out." --John 6:37. If you have Jesus, if you have the Lord, then you have life, ETERNAL Life, and you can never lose Eternal Life! Salvation is FOREVER! Once saved, you are ALWAYS saved, because God cannot lie or go back on His Word! God doesn't change His mind! Once you've received Jesus Christ and you believe on Him as your Saviour, you are a saved child of God and you're going to live FOREVER! Once you are "born again" as His child, you will ALWAYS be His child! You can't be unborn! "He that believeth on the Son HATH Everlasting Life." --John 3:36.--Right NOW! No ifs, ands or buts about it! It doesn't say you're GOING to have it, it says you HAVE it right NOW!--"HATH everlasting life!" It wouldn't be EVERLASTING if it only lasted a few minutes, till your next evil thought or next evil deed, as a lot of misguided preachers and churches teach! How can you be saved and unsaved, saved and unsaved, 100 times a day like some of these poor, ignorant Christians believe? They say, "Well, I won't know if I'm going to make it to Heaven until I'm dead and the Lord balances up and measures all my good deeds against my bad deeds. If the good ones outweigh the bad ones, well then maybe I'll make it." They never really know when or where they stand or how or if or what! It's enough to make a nervous wreck out of you, and that's what a lot of them wind up becoming--nervous wrecks! But thank God, "They that BELIEVE have entered into REST!" --Hebrews 4:3. We can have REST and PEACE of mind, knowing that we don't have to worry about whether we're good enough or if we've been too bad or if we're going to make it or not, every day wondering whether we're going to be saved or not.--We KNOW we are, if we've received Jesus! True, you can keep yourself in His WILL and in line with His BLESSINGS by obeying the Lord, doing His work, being fruitful and so on. But you can't keep yourself SAVED! JESUS did that once and forever, and His gift is ETERNAL Life! If your Salvation is not ETERNAL Salvation, it's not Salvation! If you're not saved FOREVER, you're not saved! GRACE plus FAITH plus NOTHING!--THAT'S Salvation! You don't have to be good to GET saved and you don't have to be good to STAY saved! But this does not mean that you can just live as you please once you are saved. If you commit sins against the Lord and others which are unconfessed, unrepented of and not made right, you will suffer for them in some way, "for whom the Lord LOVETH, He CHASTENETH, and scourgeth every SON whom He receiveth." --Hebrews 12:6. But even if you are disobedient, rebellious and chastened of the Lord for your sins, if you are saved, you'll ALWAYS be saved! Once you have received Jesus into your heart, that's it!--You're saved FOREVER! 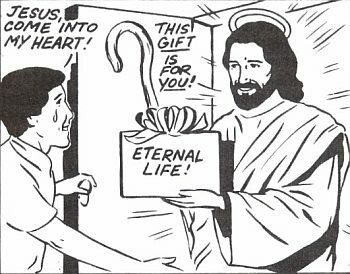 He doesn't keep popping in and out of your heart! He is there to STAY! He says, "Lo, I am with you ALWAYS, even unto the end of the World! I will NEVER leave thee nor forsake thee. For I give unto them ETERNAL life; and they shall NEVER perish, neither shall ANY man pluck them out of My hand!" --Matthew 28:20; Hebrews 13:5; John 10:28. So thank the Lord that we can be saved and KNOW it! And of course, if you really are, you'll SHOW it too. You'll no longer be like everybody else, you'll be DIFFERENT! You'll be a "NEW CREATURE in Christ Jesus: old things will be passed away; behold, all things will become new!" --2Corinthians 5:17. When you receive Jesus, your whole life will be changed like a newborn baby born into a whole new World with a new spirit as a new child of God! So don't be surprised if you actually FEEL different and even THINK differently and are happier than you have ever been before! Jesus said it is like being born again, becoming a new person, much better and happier than ever before!--With an utterly different outlook on life, a new way of looking at the World.--John 3:1-8. It's impossible for men to really change themselves, but it's possible for GOD to change ANYONE! It's never possible for US to change our hearts, it's only possible for us to ASK. And when Jesus comes into your heart, everything is changed--EVERYTHING! You are a "new creature", a new creation in Christ Jesus! If you're not changed, you don't have Jesus, because He changes people! No matter how good you are, He'll make you BETTER! YOU don't have anything to do with it, all you do is ask Him to come in and HE does it all! So expect things to be DIFFERENT!--Not totally different perhaps, as you're still human, you're still in the flesh. But you'll find a change in your spirit, in your thoughts, in your heart and in your direction. You'll be HAPPY and overflowing with LOVE! Because if you have JESUS, you have LOVE!--For "God IS Love!" --1John 4:8. Do YOU have Jesus? Have you taken Him into your own heart and been born again by His Spirit? Has His Love changed your life and made you a new person, a new creature, "old things passed away and all things become new"? You don't have to walk down to an altar, you don't have to stand up, sit down, turn over, stand on your hands, or pray in this position or that position.--It has nothing to do with the position of your body or your eyes or your head! It's all in how you position your HEART! If your heart is humble before God and you know you're a sinner and need His help, all you have to do is ASK Him into your life! Jesus says, "Behold, I stand at the door and knock: If any man HEAR My voice, and OPEN the door, I WILL come in to him, and will sup with him, and he with Me." --Revelation 3:20. Jesus' Love is all-powerful, but He doesn't FORCE you to receive it. He simply ASKS to come in, and you have to INVITE Him. That is the limitation He has set and the condition He requires: You have to open your heart's door and LET Him come in. So please take Him now! He WANTS to give you His love and peace and happiness, but He can't unless YOU want Him to. You have to ASK Him to come in. Jesus stands there, meek and mild, in loving patience, and perhaps has been for years, waiting at your heart's door.--Knocking again and again by His Word, by His Love, perhaps by some sad incident or the parting of a loved one, a death or sickness or pain. But God has left the majesty of choice up to YOU, and nobody can ever force you to accept Jesus Christ as your Saviour! You alone can make that decision, if and when you want to. He's left that choice up to YOU! "Lord Jesus, please forgive me for all my sins. I believe You died for me. I believe You are the Son of God, and I now ask You to come into my life. I open the door and I invite You, Jesus, to please come into my heart. Help me to love You and to love others by telling them about You and Your Love. Help me to read Your Word and understand it by Your Spirit. In Jesus' name I pray, amen." "Believe on the Lord Jesus Christ and thou shalt be saved!" --Acts 16:31. God BLESS you with His LOVE and SALVATION!--NOW and FOREVER!